I must thank my sister Radha for teaching me this super quick and easy, uncooked raw tomato chutney recipe. It has only 2 major ingredients.U can prepare it in just 2 minutes.No sauting,no chopping works too.This chutney is very similar to my MIL’s vengaya molaapdi (2 ingredient onion chutney).When i tried this chutney for the first time, I made it less spicy.The taste was very bad and I felt the raw smell of tomatoes too.When i told this to my sis, she suggested me to add more green chillies & try again.So this time i made it perfectly and loved its taste.This chutney tastes super spicy and its a great side dish for idli,dosa.U should have this chutney mixed with few tsp of gingely oil to enjoy its actual taste and flavour.Even Raksha liked this chutney mixed with ghee .U can grind and store this chutney in refrigerator for two days.Its taste gets improved.I hope this chutney would be useful for Bachelors & working women .Ok,lets see how to make this South Indian style easy,quick,spicy tomato chutney at home..
Don’t forget to check out my 2 ingredient easy onion chutney recipe .My most favourite chutney . 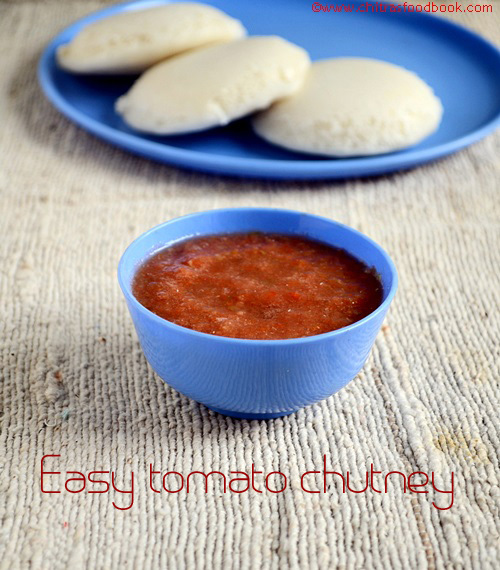 Easy, uncooked, raw tomato chutney recipe with just two ingredients - Spicy tomato chutney for idli,dosa! Roughly chop the tomatoes.Take the tomatoes,green chillies,tamarind and salt.Grind it to smooth paste.No need to add water becoz the water content in tomatoes itself is enough.Add water only if necessary. Serve with idli,dosa adding few tsp of gingely oil/Sesame oil. Adjust the quantity of green chillies based on the spiciness of chillies. Make sure that the flavour of chillies should be dominant than tomatoes. I have given in very small quantity.Try this once.If u like this taste,grind in large quantity. If u want to give this chutney for ur kids,mix little chutney in lots of ghee and serve them.Ghee helps to suppress the spiciness & reduces the burning sensation in tummy. 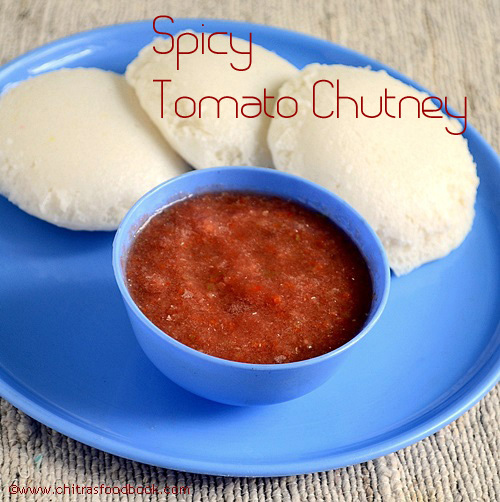 Enjoy this easy n spicy tomato chutney with idli,dosa.It tastes yum ! can something get simpler than this ? wow such an easy peasy one..
never tried chutney this way. Will try this. Tomato chutney and Idli what a combo.. Thank for sharing a nice recipe of a side dish.This is really an amazing and attractive post. I appreciate your posted wonderful photos. Thanks for sharing such an interesting post. This method of making tomato chutney is totally new.. easy and quick one..